A year ago Enbridge CEO Pat Daniel announced a new foreign partner for its Northern Gateway Pipeline project. Daniels told a meeting in Whistler, BC that Sinopec, China’s second largest oil company, was investing an undisclosed amount in the pipeline approval process in return for a guaranteed place on the pipeline and the right to pony up for an equity stake in the $5+ billion project. Enbridge’s Northern Pipeline project is a dual pipeline designed to deliver tar sands oil to tanker ports in Northern BC for delivery by tanker to refineries in China and other points east. The pipeline approval process starts next month in Kitimat and is estimated to take up to 18 months. Fast forward a year. An oil industry front group headquartered in the office of Alberta tar sands legal specialists McLennan Ross announces it will be launching an advertising campaign attacking Northern Gateway critics. The front group refuses to disclose its funding source for the ad campaign. The group, Ethical Oil, was set up by refugees from the Tory war room, Sun News and Prime Minister Harper’s office. It’s ad campaign claims that opponents are serving the energy interests of foreign powers and companies with ethically challenged records. If Ethical Oil’s concern is about supporting oil companies linked to hideous and unethical practices like the oppression of women, terrorism and human rights abuses why are they supporting a pipeline being developed in partnership with some of the most unethical companies in the world? 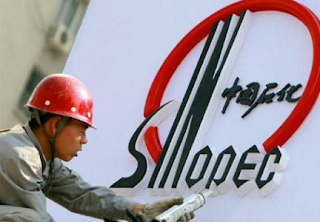 Sinopec is identified by human rights groups as one of the four worst companies operating in the Sudan. Sinopec’s partnerships with the government provides fiscal support for the Sudanese government’s genocidal military operations. The government depends upon oil revenues from Sinopec – which owns three key Sudanese oil companies – to support its military purchases and campaigns against the South. Sinopec plays a similar role in Myanmar (formerly known as Burma), partnering with one of the most oppressive regimes in the world to develop both offshore and land based oil and gas reserves. Revenues from these operations help pay for the government’s extraordinarily repressive internal security operations. For this Sinopec in 2008 ‘earned’ the second worst rating for a company operating in emerging markets from RepRisk, a company that assesses reputational risk for commercial and investment bankers and asset managers. Doesn’t Sinopec’s involvement alone in the Northern Gateway Pipeline make the pipeline just another project of unethical oil? You’d think so. But there’s more. Just this past week new funding partners have declared their investment in the Pipeline project. MEG Energy is a Northern Gateway investor partly owned by CNOOC, another Chinese company with a poor human rights record in Burma. According to Wikipedia in 2008 the US Treasury Department asserted that CNOOC was cooperating in a Burmese joint venture with a company run by a Burmese family “linked to heroin trafficking”. According to RepRisk CNPC in particular “has been heavily criticized for its exploration agreements in Myanmar and alleged support for human rights abuses in Sudan, as well as the proposed Pengzhou petrochemical plant and oil refinery in Sichuan province in China, and relations with its controversial subsidiary PetroChina”. In 2008 RepRisk rated CNPC as the company with the 4th worst reputation in the world. Partnerships with Myanmar and Sudan… links to Burmese heroin traffickers… With this cast of characters partnering in the development of the Northern Gateway, you’d think Ethical Oil would be at the front of the line condemning the pipeline. That is if you think Ethical Oil’s real purpose is to oppose unethical oil. If, on the other hand, its real purpose is to front for Enbridge with scurrilous attacks on pipeline opponents…. Well then its actions to date make sense. This entry was posted in Energy, Tar Sands. Bookmark the permalink.